20320 ft (6194 m) Highest point in North America . 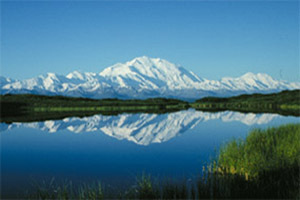 Denali (still officially known as Mount McKinley) is the highest mountain in North America, and it has the highest base-to-summit rise of any mountain on land on Earth. Although certainly non-volcanic in origin, it has been formed by the same collision between the Pacific and North American Plates which has produced the vast multitude of volcanoes in Alaska. 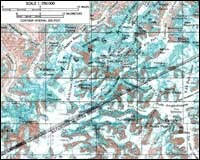 The Alaska Range is a great crescent of older plutonic and metamorphic rock thrust up by this collision, stretching for almost 500 miles (800 km) from the northern end of the Aleutian range all the way around to eastern Alaska near Tok. 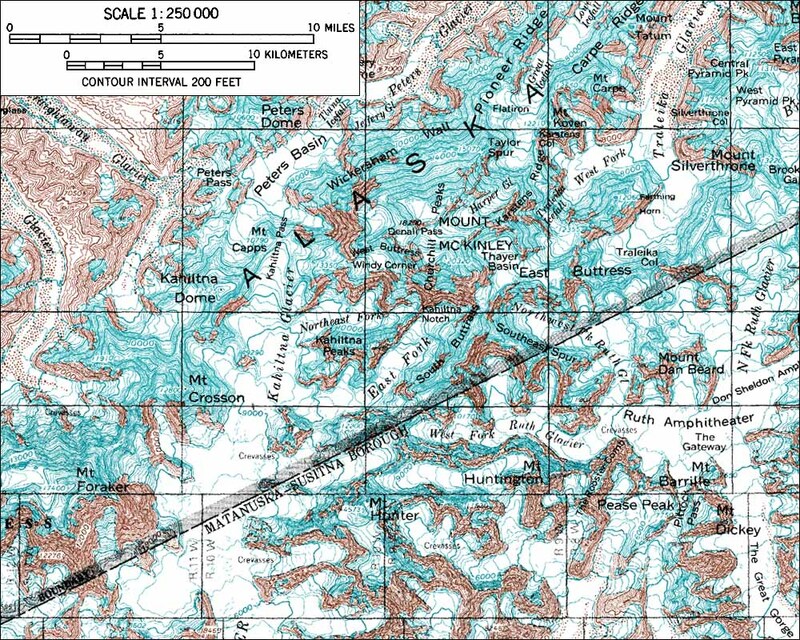 The massif of Denali is located near the center of the range and also includes 17400 ft (5304 m) Mount Foraker (Sultana) and 14573 ft (4442 m) Mount Hunter (Begguya). Ski and snowboard descents of numerous routes on Denali have been done over the past few decades, including the 14000+ vertical ft (4300+ m) descent of the Wickersham Wall on the northwest side (visible below the north summit in the photo above).